The Qing (pronounced ching) Dynasty was the second foreign dynasty to rule all China; the first being the Mongol Yuan Dynasty (1279-1368). Unlike the Mongols, the Manchu, who took the name “qing” meaning pure or clear, served as patrons of Chinese culture employing Chinese scholar-officials in high government positions. They succeeded the Ming Dynasty (1368-1644), which over time had become unable to effectively rule the country. The first one hundred and fifty years of the Qing Dynasty witnessed great strides in China’s development. China’s social order in the seventeenth and eighteenth centuries was the envy of the civilized world to the point that China was viewed as a truly enlightened country, which, in part, inspired the artistic movement known as chinoiserie. By the late eighteenth and early nineteenth century, with the increasing industrialization of Europe and the need for ever new markets for manufactured goods, the earlier attitude toward China altered completely. The Chinese were increasingly regarded by the Europeans as backward looking and in need of guidance from the now “more advanced” West. This resulted in a series of Sino-European wars beginning in the 1830s and continuing to the Boxer Rebellion of 1900 and the ultimate collapse of the Qing Dynasty in 1911. The exhibition, China’s Last Empire: The Art and Culture of the Qing Dynasty, will examine this last Imperial period in China’s long and distinguished history. It will be organized into four themes: Imperial, literati, beliefs, and interactions. The Chinese bureaucracy was composed of scholars who rose through the governmental ranks by their own erudition. The literati, as they were called, were skilled not only in governance but also in painting, calligraphy, and seal carving. This section of the exhibition will document their lives in Imperial time through the objects produced by and for this class, which include objects made for the scholar’s table as well as examples of the paintings and calligraphy produced from that table. 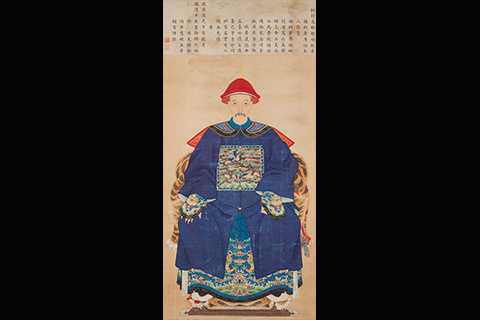 Among the objects in the Imperial section is a significant Imperial document, a Patent of Nobility, which chronicles the successive generations of the Chinese family of Pianzhu-er, who was a member of a banner family that supported the Manchu Qing cause. In addition there are porcelains, dating from the seventeenth through the early twentieth century, made for the Imperial household. Other objects include an Imperial court robe, seal box, and official badges of rank. The Chinese belief structure is rarely incorporated into exhibitions for the general public. The exhibition will address the Qing belief structure including Confucianism, Daoism, and Buddhism through paintings, sculptures, and temple and household religious artifacts. This section will also include examples of the cross-cultural religious influence of China on both Korea and Japan. While trade with China began in Roman times, there was little or no direct contact between Europe and China until the arrival of the Portuguese in the late sixteenth century. The exhibition will examine the role of trade in Chinese commodities, particularly pottery and porcelain, and its impact on how Europeans viewed, expressed, and changed their impression of China over time. Among the objects featured in this section is a never before exhibited eighteenth-century Italian watercolor of a Chinese procession in the capital city of Beijing. The exhibition will also feature drawings by the French artist, Auguste Borget, who traveled throughout China in 1838-1839. The development of a scholar or literati class was one of the most significant contributions made by China to the artistic development in Korea, Japan,and Vietnam. The final section of the exhibition will focus on the cultural role China played in the development of the literati or Nanga style of painting in Japan. Both Chinese and Japanese paintings will illustrate the similarities and differences between the Southern School as it developed in China and its adoption and adaptation by the Japanese from the late eighteenth century onward. China’s Last Empire: The Art and Culture of the Qing Dynasty, is curated by Brian A. Dursum, Director and Chief Curator of the Lowe Art Museum, who is also the museum’s curator of Asian art. Dursum is working with East Asian and Japanese specialists including Dr. Stephen Halsey,Assistant Professor, Department of History, University of Miami; Dr. JustinRitzinger, Assistant Professor, Department of Religious Studies, University of Miami;Dr. Marc Knecht, Associate Professor,Department of Chemistry, University of Miami; Dr. Daniel McKee, Adjunct Assistant Professor and Japanese Bibliographer,Cornell University; Dr. Chang Qing,Visiting Professor, Department of Art History and Archaeology, Washington University in St. Louis; Barbara GiordanaStaniszewska an independent scholar focusing on European travelers to China in the nineteenth century. In keeping with the Lowe’s mission “to research the permanent collection and publish the findings,” a fully illustrated, 240-page catalogue will be produced for the exhibition, which will be further augmented with gallery text panels and descriptive labels.